We install boilers, including Oil & LPG. Customers return to us for all their plumbing and heating needs because of our enviable reputation & competitive prices. Established since 1981. With 35+ years experience our expert Engineers are on hand to deliver professional services to match your budget. We offer FREE no obligation quotations for all your boiler installation, boiler servicing and central heating requirements in and around the Cardiff and Newport areas. 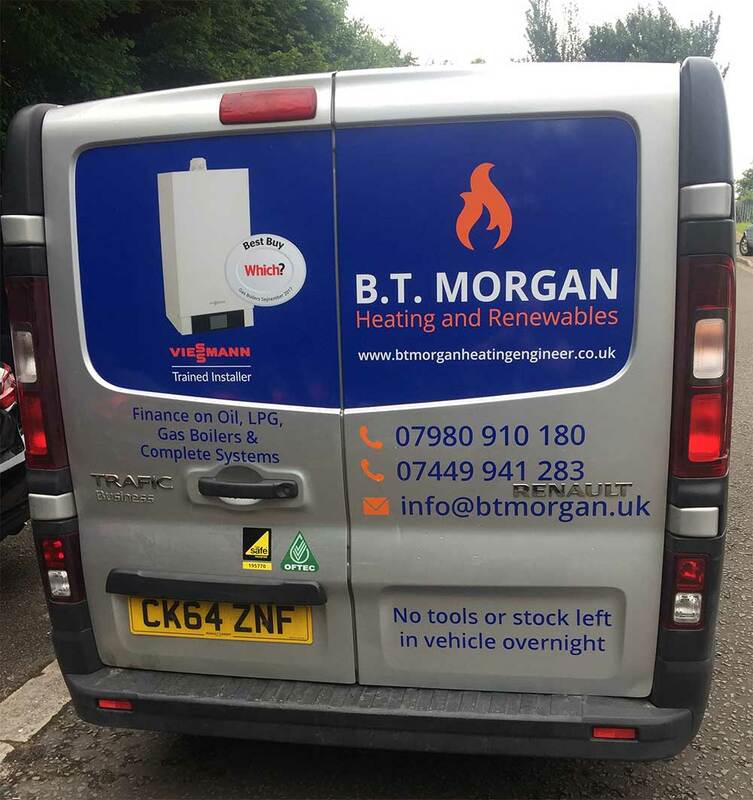 We pride ourselves on producing high quality installations combined with exceptional customer service ensures B T Morgan Heating Engineers maintain's a loyal customer base. We are always available to discuss and give FREE advice on any of your heating and plumbing requirements. Choosing a new boiler need not be complicated, we will advise you on the type and size to suit your home and then offer you the choice of Warranties from 5 to 10 years. We deal with all the major manufacturers such as Viessmann, Worcester, Ideal, Baxi and Vaillant and offer a professional installation service and boiler repair service. Great Finance options available on all the above, why not spread the cost of your new boiler over 3, 5, 8 and 10 years. At the heart of your Central Heating System is the Boiler, the Boiler is the engine and the driving force which supplies us with Heating when we are cold and hot water on demand that we take for granted. If your old boiler is not performing correctly then your energy bills could soar and you can expect some hefty repair costs, maybe its time to change we can offer competitive prices with substantial warranties. B T Morgan Heating Engineers has aligned with Viessmann UK. The Viessmann brand represents the highest quality in house engineering and we are glad to be partnered with a Premium boiler brand, enabling you the client to benefit from free extended warranties, great customer support, manufacturing their patented stainless steel heat exchanger which far out performs any other manufacturer. Heat exchangers are the engine of the boiler and Viessmann assure the quality, with an unrivaled 10 year warranty on every heat exchanger. Just for clarity every Viessmann boiler contains the patented stainless steel heat exchanger!! What is the best combination boiler? Easy one this. The best Combination boiler is a boiler that has been correctly installed, commissioned and correctly sized for your home. It will carry at least a 5 year parts and labour warranty [subject to an annual service] or possibly 7 to 10 years. The complete system will have been chemically cleansed or flushed, and will contain a magnetic filter to carry on filtering out magnetites for years after it has been installed. They should also come with a programmable room thermostat for ease of use around the home. If all the above is present and correct then let the manufacturer worry about the rest. It is as simple as that preventive maintenance is key to a boilers efficiency and longevity, ask any manufacturer. What is the most efficient Boiler ? Condensing Combination Boilers are the most efficient and range from 89% to 91%, with the addition of a smart control such as a Nest Generation 3 Learning thermostat this can be increased up to 95%, The main reason is that combination boilers only heat up the hot water required and therefore you are not paying for stored hot water. What savings can I expect ? That will depend on the system you are changing from, the Energy Saving Trust state that changing from a G rated Boiler to an A rated boiler with new controls can save you up to £340 per year, based on a Semi Detached 3 bedroom house. What are the benefits of adding smart controls ? Increasing system performance of up to 6% in real terms saves energy, optimises comfort levels throughout your home and complies to Boiler Plus Legislation currently in force in England and soon to be Wales and Scotland. Smart controls such as the ever popular Nest Generation 3 Learning Thermostat offers the user flexibility to add other smart devices such as Smoke detectors, Carbon monoxide detectors and can even control your lighting. Controlling your Nest thermostat from your mobile device via a free app download gives the user or users total control from any location in the world. Imagine if you have an elderly or vulnerable relative, smart controls enable a third party to monitor temperatures and ensure that comfort levels are met. Nest generation 3 learning thermostat also monitors the user behavioral patterns and adjusts settings to suit hence the name Smart Thermostat (it senses when you are home). Comparing the initial outlay verses the pay back is a no brainer, as this can be paid back in as little as 2 years! !